Los verbos modales de posibilidad, como su nombre implica, indican la posibilidad de que cierto suceso se lleve a cabo. 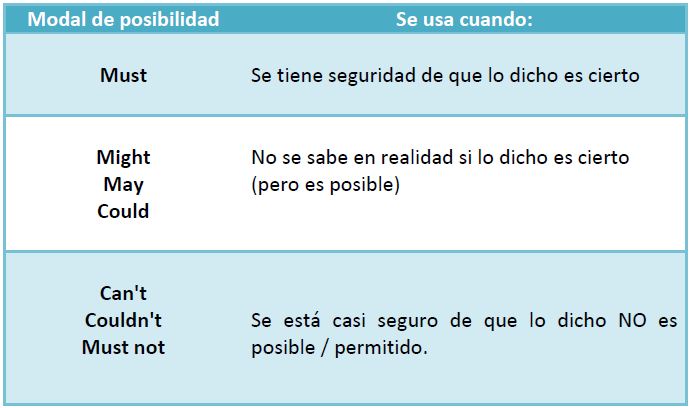 Es la finalidad de esta lección el explicar en qué situación utilizar "must be","might be" y "can't be", al igual que presentar algunos ejemplos de su uso en inglés. El siguiente cuadro indica cual modal de posibilidad utilizar con respecto al grado de certeza que tengamos al decir / escribir una opinión personal. 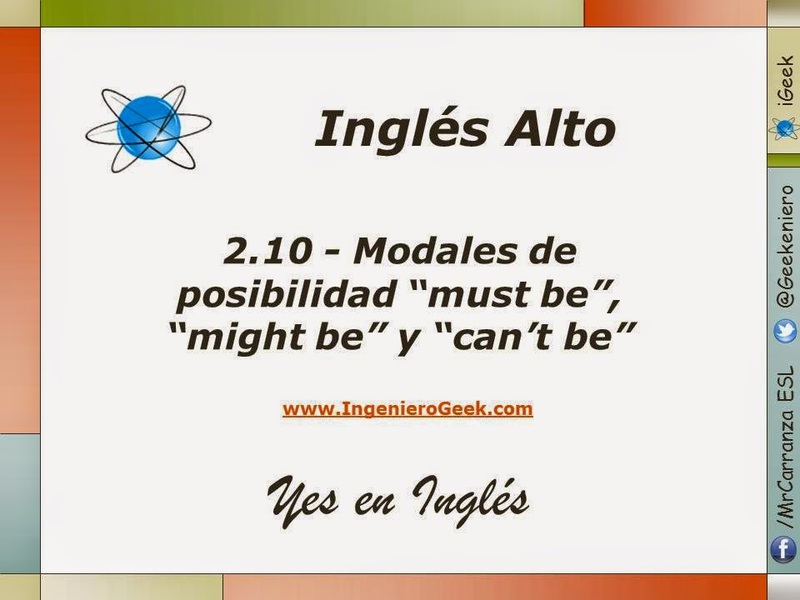 Es importante decir que los modales "might be", "may be" y "could be" nos servirán para indicar un mismo grado de certeza, así que en la práctica no existe diferencia. 1.- The store must be closed at this time. 2.- A little girl must not be in the street so late. 3.- My sister may be sick. 4.- Oscar's car might be broken. 5.- That smartwatch could be a success in sales. 6.- Our neighbors might not be at home. 7.- These books may not be interesting for you. 8.- This internet must not be slow. 9.- Marla couldn't be on time for the class. 10.- Good books can't be short. Una oración que utiliza un modal de posibilidad, como los antes mencionados, usualmente se acompaña con otra oración que intenta explicar / reforzar la opinión propia. Nótese que se ha utilizado el modal "might" porque el hecho de que la persona hable inglés no asegura que sea de Inglaterra (pero es posible). De la misma manera los siguientes ejemplos se basan en la lógica para usar el verbo modal adecuado. 1.-Richard lives in a very big house, he must be very rich. 2.- That woman is wearing a wedding ring, she must be married. 3.- Larry might be busy, he didn't answer my messages. 4.- My roommate can't be at the church, he's not a religious man. 5.- This movie has many positive reviews, it can't be bad. Recuérdese que los verbos modales de posibilidad se usan para emitir un juicio u opinión personal sobre un tópico y este se basa en la certeza personal, es por esto que es de suma importancia saber en qué contexto utilizar cada uno de ellos y así expresarse de una mejor manera. Modal of possibility + verb "be"
La forma base del verbo se refiere al infinitivo, se muestran algunos ejemplos a continuación. 1.- The store must close at 11:00 PM. 2.- The fans of the company might buy the new device. 3.- The company can't give vacation to the employees right now. De este conocimiento, como muchos otros, se podrá sacar provecho en unidades más avanzadas. 1.-Peter can´t be doing exercises every day because of work. 2.-Pamela doesn't answer my calls, she might be sleeping. 3.-My internet is slow, must be one technician problem. 4.-Gabriela loves reading books, she must be intelligent. 5.-Monica is always smiling, must be by the love. 1.- Peter exercises every day, he must be a sportsman. 2.- Pamela doesn't answer my calls, he might be asleep. 3.- My internet is slow, it can't be worse!. 4.- Gabriel loves reading books, he might be a great writer. 5.- Monica is always smiling, she must be happy. 1.- Peter exercise every day, I may de go to too. 2.- Pamela doesn´t answer my calls, She must be sick. 3.- My internet is slow, I can´t repair. 4.- Gabriel loves reading books, He must be wish a new book. 5.- Monica is always smiling. She could be very happy. 1.- Peter exercises every day, he must be a healthy man. 2.- Pamela doesn't answer my calls,she might not be at home. 3.- My internet is slow, it might be becouse it is raining. 4.- Gabriel loves reading books,he must be polite and iteresting man. 5.- Monica is always smiling, she might be a friendly and happy girl. 2.- Pamela doesn't answer my calls, she must be sick. 3.- My internet is slow, must be it's raining. 4.- Gabriel loves reading books, he must be a lover books. 5.- Monica is always smiling, she must be happy with your boy friend. Eulalio Nava Cruz 6° IM Sabatino. 1.- peter makes exercises every day, the must be very healthy. 2.- pamela doesn't answer my call, she couldn't be at home. 3.- My internet is slow, it might be a virus on my computer. 4.- Gabriel loves reading books, might be your favorite pastime. 5.- Monica is always smiling, must be a very nice girl. 2 pamela might not be at home, she didn` t answer my messages. 1.- Peter exercises every day, he must be strong . 2.- Pamela doesn't answer my calls,might be that lost your cell.